Those of you who have not yet watched King Corn are in luck! I just heard that the film will be airing on PBS on April 15th as part of their Independent Lens series. If you don't have a clue who/what King Corn is, let me enlighten you. 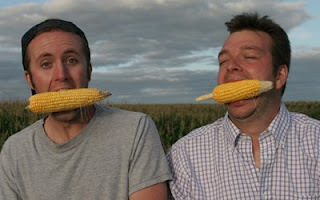 King Corn is a recent documentary film about the enormous role corn plays in our country (and in each of us) that was made by two young pups named Curt Ellis and Ian Cheney. If you're curious, you can check out my interview with the guys from this fall and tune in on to PBS on April 15th. Curt has graciously offered to mail me some DVDs so if you'd like a copy for home use, please just let me know and I can hook you up.